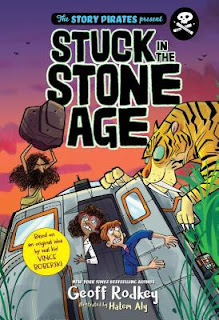 Stuck in the Stone Age, by Geoff Rodkey (Rodale Kids March 2018), is the sort of romp of a book, generously fonted, with lots of humor (sometimes slapstick) and some poop (not the stuff of jokes, but actually adding value to the story, about which more later) that many elementary/younger middle grade kids love! In case that isn't clear, the cover art is a good indication of the type of book it is. The two have very different takes on being trapped back in time. Tom feels rescue will arrive, and invents the game of rock ball, which proves hugely popular. Marissa is less sanguine, and applies herself to inventing agriculture (less popular), ,and using poop as fertilizer (and trying to introduce the concept of hygienic living in the process (also not popular). Poop also comes in handy when the need for explosive devices arises…. She also single-handedly kills a sabre tooth tiger. And the two do eventually get home again! Marissa (shown on the cover as a black woman--so yay for an example of fictional brilliant black woman in a kid's book!) finds success in science due to her brilliance, and she has learned to appreciate Tom's people skills, and he finds a role in which he can succeed as well. So it's a fun, and funny, story, that should appeal to the target audience lots (despite the fact that the protagonists are grownups in age, they read a lot like kids, so that's not a problem), and is fine reading for a grownup in need of something light and undemanding! It is not a book that will teach you anything about Neolithic culture; that part is primarily stereotype, but it's an entertaining example of struggling to survive in a very different culture....if you aren't looking for much nuanced detail about that culture. What makes this of interest to educators is that it is the first in a series designed to inspirer young writers. Indeed, the premise of the book came from a real kid. Pages 194 to 267 are a "Story Creation Zone," with lots of tips and helpful guidance for young writers, and in the actually story there are interjections (unobtrusive) that take readers to the section of the Story Creation Zone that deals with a particular topic (like setting) when relevant. I think the presentation of amusing story and friendly story writing guidance is the sort of thing teachers and their students might well have success with! I do love Geoff Rodkey's books. I hadn't heard of this one but will be looking for it. Thanks for the post. My kids heard about this book on Story Pirates and I just ordered it based on this review. We are looking forward to reading it!